Calling the arrests in a case related to the Bhima Koregaon violence a direct assault on civil liberties, over 35 civil rights organisations protested against the police action in New Delhi. 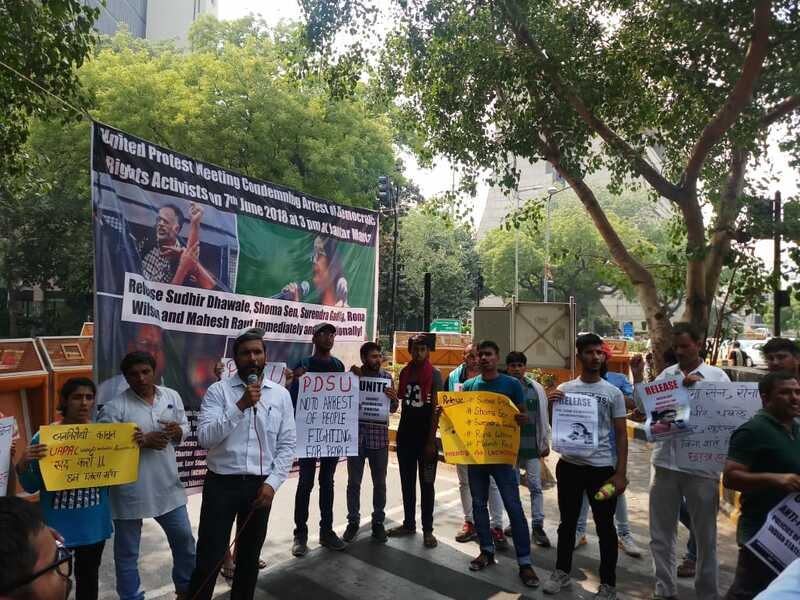 New Delhi: Following the arrest of five activists from across three cities in a case related to the Bhima Koregaon violence earlier this year, over 35 civil rights organisations protested against the police action in the capital. Prominent lawyer at the Nagpur high court Surendra Gadling; Shoma Sen, professor of English at Nagpur University; Sudhir Dhawale, Marathi poet and editor of Mumbai-based Vidrohi magazine; New Delhi-based Rona Wilson of a civil rights group called the Committee for Release of Political Prisoners (CRPP); and Mahesh Raut, an anti-displacement activist who has been recently supporting the people’s movement against indiscriminate mining in Surjagarh, Gadchiroli (Maharashtra), were arrested on June 6 in different cities as part of a joint police operation spearheaded by the Pune police. 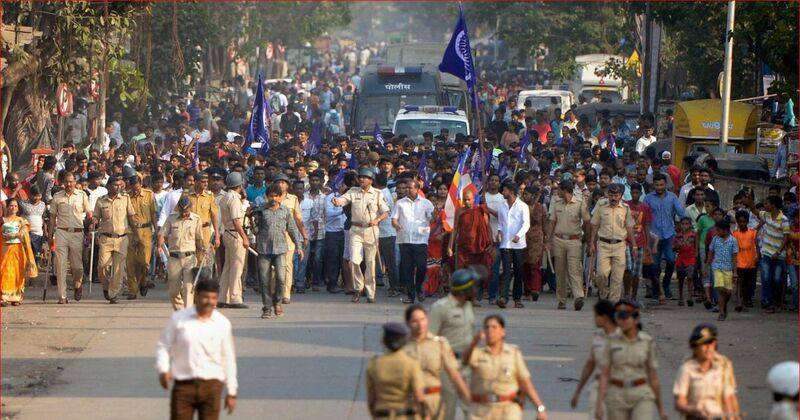 The police has claimed that the arrested people are “urban Naxals” and that Maoists were behind the Bhima Koregaon agitation in which one Dalit youth was killed and thousands were injured. The event had seen large participation of Dalit ideologues and civil rights activists. However, the Indian Association of People’s Lawyers (IAPL), which led the Thursday protests, alleged that the joint police action against the five people was a direct assault on civil liberties and was intended to deflect attention from the cases against the two main accused – well-known Hindutva leaders Sambhaji Bhide and Milind Ekbote – in the case. Asserting that Gadling is a well-respected figure in Nagpur, Bharadwaj said that Gadling had also been appointed as a special public prosecutor by the state government in a sexual violence case. “Apart from his role in the courts, advocate Gadling has been an important voice among the lawyers’ fraternity and activists to raise concerns of people from marginalised communities, and in defense of reservation, independence of judiciary and for democratic rights. He has been instrumental in organising mass awareness programmes and fact-finding missions in association with senior retired high court and Supreme Court judges,” a press release by IAPL said. Bharadwaj also said that the police has not yet produced any evidence against the any of the five arrested persons. She pointed out that the Pune police violated procedural norms and produced Gadling on the morning of June 7 at the judge’s residence and got the permission a putting him in police remand. Similarly, Mahesh Raut too had no direct connection with Bhima Koregaon event. He, however, was playing a prominent role in the Surjagarh anti-displacement movement. “That is why we suspect that the police action against such voices are actually intended to facilitate corporates and private mining,” she said. She added that while Dhawale was a part of Elgar Parishad, the committee which organised the Bhima Koregaon event, Sen, like so many other prominent citizens, which include retired judges, teachers, professors, journalists, supported the Dalit memorial event. “We only know that the draconian Unlawful Activities (Prevention) Act (UAPA) has been slapped against them but it is still not clear on what grounds did the police take such an action,” she said, saying that the police has not produced any concrete evidence for placing them under such a stringent law. She further said that an FIR was lodged against Dhawale in January in the Bhima Koregaon violence case but until now the police, despite many raids, could not produce any evidence against him for inciting violence. “Similarly, all of a sudden, Gadling’s and Wilson’s houses were raided in April but could not find any evidence,” Bharadwaj said. In an intriguing interjection, she pointed out that the investigating officer and the IG of police in the cases against the five activists and G.N.Saibaba’s case were the same. “It was Gadling who cross-examined Suresh Bawachi, the investigating officer, and Kadam, the I.G in Saibaba’s case. And now they are handling Gadling’s case too. Vengeful police action cannot be ruled out thus,” Bharadwaj said. At the same time, Bharadwaj said, no action has been taken against the main accused – Ekbote and Bhide. 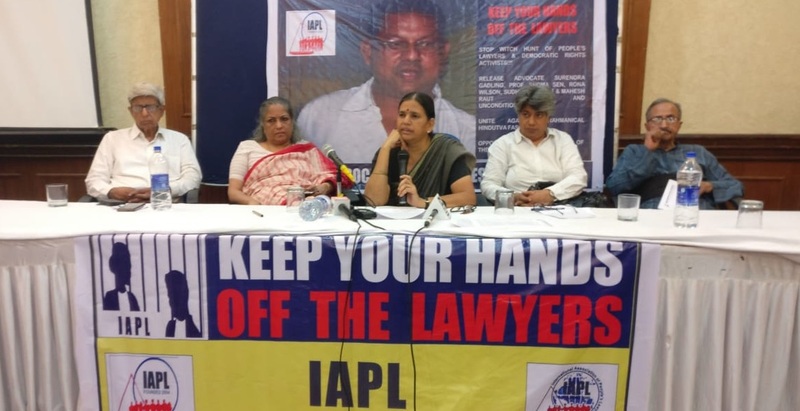 “Many groups of Dalit lawyers started getting together to defend them (hundreds of Dalit youth who have been incarcerated in false cases of rioting in the aftermath of Bhima Koregaon violence), even free of cost, no doubt this must have caused great unease in the vindictive state apparatus. The bias of the state is all the more obvious when the leaders of Hindutva organisations named in many complaints and FIRs as instigators of the violence – Ekbote and Bhide – whose anticipatory bail applications have been refused by even the Supreme Court, still roam free,” the IAPL press statement said.